I wish that this film, which director Tally Abecassis spent ten years creating, had been better. I wanted to love it, and while I fell in love with a couple of the characters in it, I couldn't help but feel that the cumulative effect was not as powerful as it should have been. 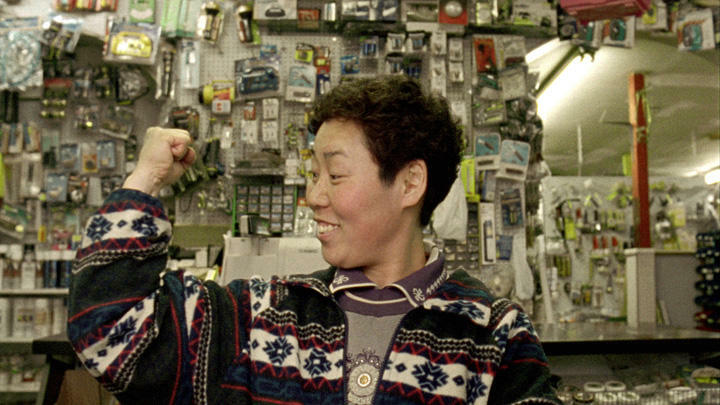 The film follows three small business owners - proprietors of the kinds of weird neighbourhood shops you pass by every day, and hardly notice. Or, perhaps you wonder how they could possibly still be in business, with their old, dusty signs and cluttered storefronts. The three people she selects are hardware store owner Jae-Gil, a Korean tomboy who was known back home as "Miss Key" for her lock-picking abilities; Peter, the wisecracking watch repairman who complains about the loss of his youthful good looks but whose livelyhood is actually threatened by his failing eyesight; and Norman, a dapper photographer who runs an old fashioned portrait studio. All three businesses are constantly on the brink of financial ruin - Jae-Gil's because of the increasing number of big box stores crowding out her over-stuffed, tiny hardware haven, the other two simply by the ravages of time and age on their owners, and the inevitable changes of technology. After all, most people throw out a watch rather than having it repaired these days, and nobody goes to a portrait studio for passport shots when you can get them done at any corner store. Abecassis visited the three struggling entrepreneurs for a decade, and watching them age, go through divorces, heartaches, and the inevitable closure of at least one of their shops is, indeed, touching. But somehow, an element of intimacy is sorely missing from these very personal tales. It's as though a vast distance was maintained between her and her subjects in spite of the fact that the relationships have lasted for such a significant period of time. A fascinating subject, to be sure, and a must see for anyone who loves those weird old nooks & crannies in their own neighbourhood.